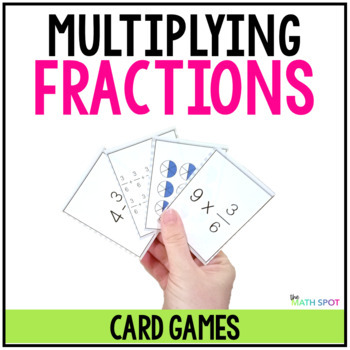 Your 5th grade students are learning about multiplying a fraction by a whole number, with this deck of cards they can play multiplying fractions games and solidify their understanding while playing fun card games! 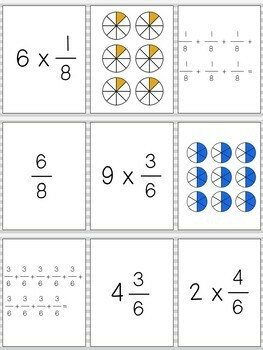 Multiplying a fraction by a whole number seems like a high level and difficult task, however, by linking to representations your students already know the skill is easily within reach! As your students play cards games with this deck, the “sets” of cards they are looking for will be sets of cards that all represent the same amount. Print, laminate and cut the game cards. You may even wish to make a few decks! 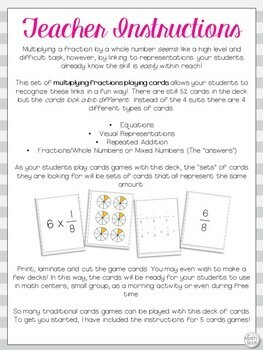 In this way, the cards will be ready for your students to use in math centers, small group, as a morning activity or even during free time. So many traditional cards games can be played with this deck of cards. 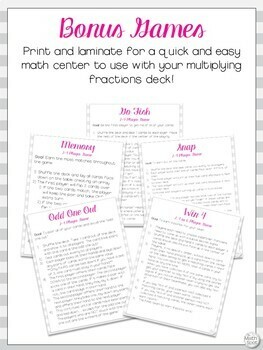 To get you started, I have included the instructions for 5 cards games! And remember, follow my store so you will be updated when new resources are added! I list many products on sale for the first 24 hours!